Get "The Pizza Book" Now! Pizza Stone This is essential to great pizza! I can't emphasize enough the benefit of using a pizza stone to cook pizza! Your pizza crust will have the unmistakable taste and feel of a professionally cooked pizza. The best pizzas I have ever had, have been cooked in brick and stone ovens. A pizza stone, although not as good as a brick oven, will give very satisfactory results. You can also use the stone to cook bread as well as other baked goods. My stone stays in the oven all the time. When I cook, I place all of my baked goods on the pizza and cooking stone. The stone requires no maintenance and is very easy to clean. (Click on link to learn how!) To clean just brush with a cloth. (Link opens in a new window). A pizza stone will last many years. This is a wonderful investment for any cook! Take your pizza to the next level, invest in a Pizza Stone! Watch me as I make pizza dough from scratch! Make pizza, be happy! The Absolute most incredible Pizza Tools are available at Forno Bravo! I have received many reports about defective Pizza Stones. Inferior quality Pizza Stones will crack when heated to the high temperature necessary to cook pizza. Only purchase a pizza stone that is top quality, and made to last! To make great pizza, you need great tools! so you can make your own pizza at home!!! A small investment for many, many, years of fun! 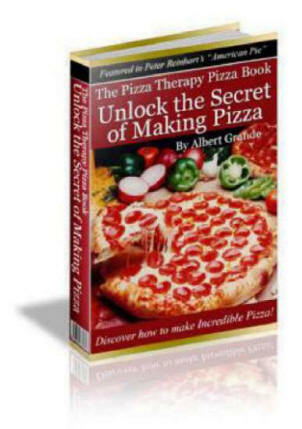 "The Pizza Book from pizzatherapy.com!"